Image Size: 28.5" x 24"
Paper Size: 34.5" x 24"
Combat aircraft are a little like racehorses...they can only go around the track a certain amount of times before they are worn out. An airplane that has attained an advanced state of decrepitude, such that it is no longer considered safe for combat missions is considered to be "war-weary". In the Southwest Pacific Theater of operations, consignment of worn-out aircraft to the bone-yard was an unaffordable luxury in 1944. For utility was still to be squeezed out of an airplane which could still wheeze down the runway and struggle into the air, and enough optimists could be found to fly her. 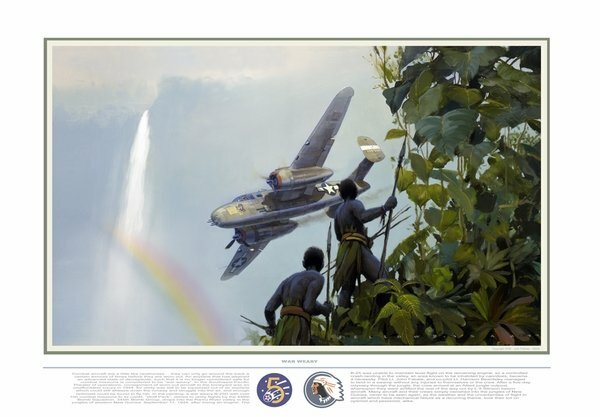 In the painting, a war weary B-25D with over 100 combat missions to its credit, "Wolf Pack", retired to utility flights by the 498th Bomb Squadron, 345th Bomb Group, drops into the Ramu River valley in the jungles of western New Guinea, September 11, 1944, after losing an engine. The B-25 was unable to maintain level flight on the remaining engine, so a controlled crash-landing in the valley, an area known to be inhabited by cannibals, became a necessity. Pilot Lt. John Fabale, and co-pilot Lt. Harrison Beardsley managed to land in a swamp without any injuries to themselves or the crew. After a five-day odyssey through the jungle, the crew arrived at an Allied jungle outpost, whereupon they were airlifted the rest of the way out by L-5 Stinson liaison aircraft. Many aircraft and their crew simply vanished into the jungle of New Guinea, never to be seen again, as the weather and the uncertainties of flight in aircraft which have mechanical failure as a recurring theme, took their toll on optimist and pessimist, alike.